Wow, Gavin has seen tremendous improvement in so many variables. I will display them here below. Could only turn 60 degrees to the right and 45 degrees to the left before training. Gavin can now rotate 80 degrees to the left and 80 degrees to the right. HUGE improvement. No imperfections in movements after training, there were 2 imperfections present before. Composite score of Right leg before training was 83% of leg function and left leg was 81% of leg function. After our current exercise routine of a month and a half his legs have become equal and are both 92% of leg function. The goal is to improve above 94%, therefore I am going to incorporate 10 minutes of vibration training with Gavin which we had a tutorial on today. We have data that the vibration platform greatly improves balance. We will also continue our current squat, lunge, and Romanian Deadlift routine. Gavin's kneeling medicine ball throw improved from 16 feet 7 inches to 20 feet 7 inches! That is a 4 foot improvement in throw distance and shows dramatic improvements in explosive power. Can perform 5 x 4 repetitions with 105 lbs. Improved from 2 minutes and 20 seconds to 4 minutes and 15 seconds. 2 minute improvement. 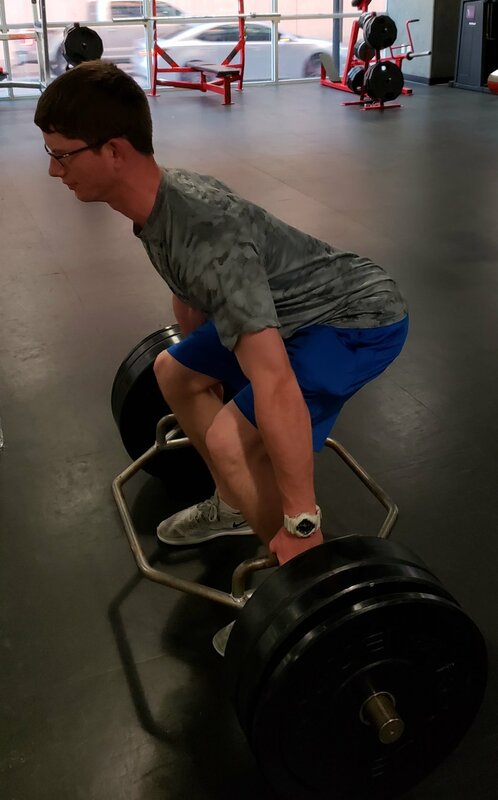 Gavin is now performing 2 repetitions of the barbell back squat with 245 lbs where we started at 95 lbs. Close to eliminating right trunk lateral flexion.